For the longest time now I have been wanting to buy an Android tablet with an E-ink screen, and while Earl isn't quite the consumer model I wanted it has me drooling none the less. Earl is a rugged Android tablet built around a 6" HD E-ink screen . It's destined to go out into the wild blue yonder, and comes equipped with a frontlight, solar panel, and a rugged shell that is both water and impact resistant. Or at least it will be destined to go wild - if it gets enough pre-orders. This tablet is not going to win any awards but the specs are solid nonetheless. It's running Android 4.1 on a dual-core 1GHz CPU with 1GB of RAM, 16GB Flash storage, and a microSD card slot. This is also a well connected tablet with Wifi, Bluetooth, GPS, a conbo AM/FM/SW/LW radio, and a FRS/GMRS/MURS radio for picking up emergency transmissions. But the screen, now that's where things get interesting. Earl uses an HD screen originally developed by LG Display. Unlike the average E-ink screen, the screen on the Earl is flexible, making it much more likely to survive rough treatment. 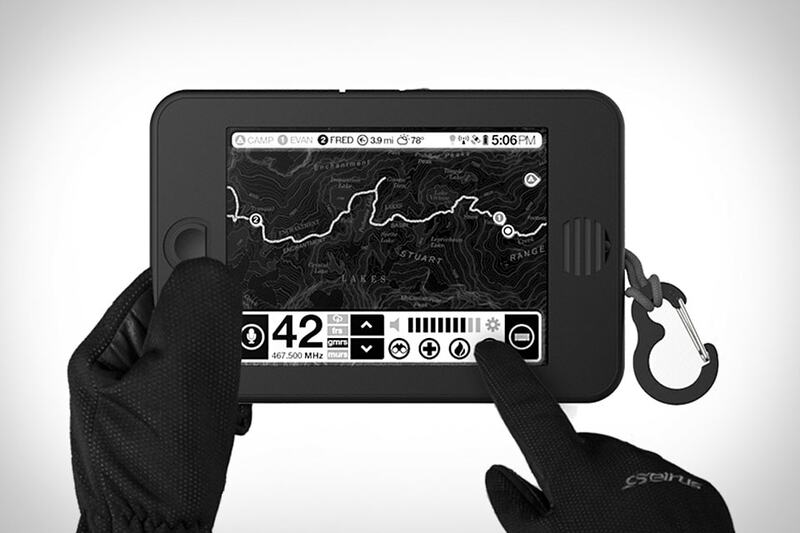 This screen is also equipped with a frontlight and a glove/pointer friendly IR touchscreen. And that's not all. Earl can also double as a weather station - and then some. It's equipped with a magnetometer, thermometer, barometer, humidity sensor, and an anemometer. Other sensors include GLONASS, an accelerometer, a gyroscope, and an IR blaster for communicating with other gadgets. 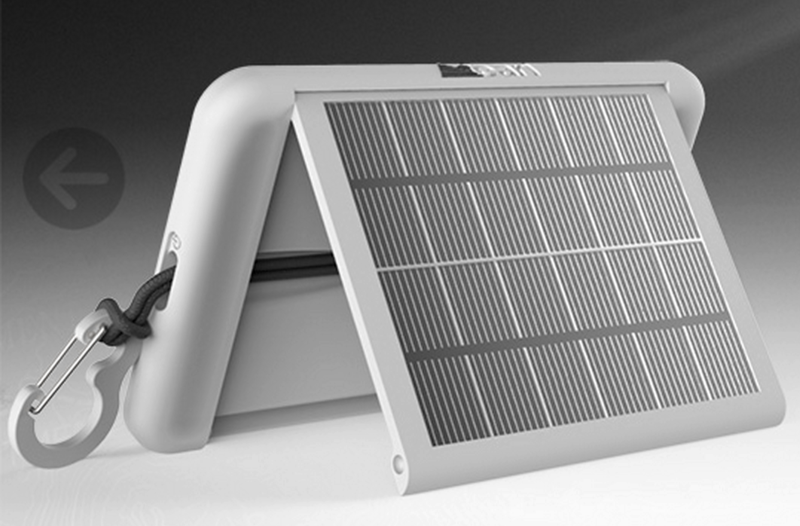 Plus it can recharge itself with the solar panel conveniently mounted on the back. This tablet weighs in at a svelte 303g, and is expected to have a battery life of 20 hours. Earl is up for pre-order at the moment, and the asking price is $250. Sqigle, the company that developed Earl, is looking to raise $250,000 so they can take Earl from the current prototype to a full-fledged backwoods companion. The $250 price tag is supposed to represent a discount of 30% off the regular price, which sounds a little low to me. The specs listed for Earl sound awfully expensive, so I wouldn't be surprised if this tablet ends up selling for more than $350. In fact, that price tag might end up being more than a tad unrealistic. I'm not sure that Sqigle will be able to sell enough units to keep the price tag below $450 or $500. Earl might be able to do a lot, and it doesn't really have much competition at its price point, but there are only so many potential customers. But as I sit here looking at it, I think Earl could easily find a home in the academic market. Elementary and middle schools might jump at a chance to buy a rugged tablet with all those sensors. If nothing else Earl would simplify their equipment lists for science class. Sqigle hopes to get Earl into production in July, with the first units shipping by the end of summer. Yes even for $350 it is extremely cool thing. Though 20hrs is rather low lifetime. Would be interesting to see how long it survives in tracking mode say GPS checkpoint every 30 min? I’d like to see something like that without the ruggedness rubbish at an eReader’s price point. It would be useful to have an electronic workbook with Bluetooth for input device connectivity and maybe HDMI for a monitor, too. Although the latter connectivity could also well be realised by Miracast or WiDi. For special purpose use, for which the device in the article seems to be designed, I’d rather prefer a modular concept, where a basic device like the one I described could serve as a plug-in control module to some sensor shell(s) that could be scenario-dependently clipped on and off. The screen and sensor suite will sell the thing. The military might have a use for it. I wonder how water resistant it might be; boaters, Coast Guard, etc. But if they can hit $250 build cost and sell for $299-350 it will sell 10,000 a month. I hope they’re ready to grow fast. The educational market is a good idea but they’d have to make it possible to deactivate the AM/FM radio. Maybe a stripped-down version? 20 hours battery life? but not unlimited with solar panel? That is likely Truth in Advertising. 20 hours would be without solar charging. Which, frankly, I doubt would add much to the battery life in the typical usage model. Adding a couple hours of charge via solar would probably take a couple days of charging in real world field use. In fact, if they ever do get close to manufacturing and they have trouble getting the build cost where they need it, taking out the solar and dropping in a bigger battery would do the same job cheaper. TBH the solar panel is more of a gimmick than a practical feature. It’s not big enough to really recharge the tablet. But even if it were, you would still need to stop using the tablet at some point so it could recharge. The mere fact that this has an e ink display is the obvious selling point here and makes it an absolute killer for use outdoors. I use my smartphone as a mapping gps unit and the screen in daylight is a pain in the ar*e! I’m presuming the battery life of 20hrs is with all functions operating so if it was only used outdoors for occassional perusal it would easily last for a multi day hike (and possibly indefinitely, if it can be strung up on your backpack to recharge as you hike). I really hope this comes off for the company and if I could spare the cash, I’d invest in this. I think they’re onto a winner here and maybe one day a colour version might become available with longer gauranteed battery life ( the ability to have a large library of natural history field guides etc would be fantastic!). This would be the ultimate convergance device for the outdoors IMHO. Hmm, good point; those kinds of outdoor use is one area where the pastel saturation (or lack there-of) of color eink is not a show stopper.